LAS VEGAS--(BUSINESS WIRE)--CONSUMER ELECTRONICS SHOW — Cypress Semiconductor Corp. (NASDAQ: CY), the embedded solutions leader, today announced the expansion of its industry-leading wireless connectivity portfolio for automotive infotainment with a trio of new products. The Wi-Fi® and Bluetooth® combo chipsets and supporting software serve as application development platforms that enable multiple users to connect and seamlessly stream unique content to as many as 10 mobile devices simultaneously. The new infotainment platforms include a Wi-Fi 6 (802.11ax) and Bluetooth combo solution that features Cypress’ Real Simultaneous Dual Band (RSDB) architecture. RSDB has become the de facto standard for premium connected infotainment experiences, enabling two unique data streams to run at full throughput simultaneously by integrating two complete Wi-Fi subsystems into a single chip. Wi-Fi 6 enables gigabit-level throughput and improves reliability for content streaming to multiple devices at once. Cypress’ automotive wireless solutions are fully automotive qualified with AEC-Q100 grade-3 validation. Cypress’ existing solutions have been designed in by numerous top-tier car OEMs and automotive suppliers and are in production vehicles today supporting infotainment and telematics applications such as smartphone screen-mirroring, content streaming and Bluetooth voice connectivity in car kits. More information on Cypress’ automotive wireless solutions is available at www.cypress.com/products/automotive-wireless. Cypress works with the world's top automotive companies to develop leading-edge automotive systems, including Advanced Driver Assistance Systems (ADAS), 3-D graphics displays, wireless connectivity, full-featured touchscreens and superior body electronics. Cypress’ automotive portfolio includes Traveo™ and PSoC® microcontrollers (MCUs), CapSense® capacitive-sensing solutions, TrueTouch® touchscreen solutions, Wi-Fi®, Bluetooth® and USB connectivity solutions, power-management ICs (PMICs), and NOR flash, F-RAM™ and SRAM memories. The portfolio is backed by Cypress' commitment to pursue zero defects, provide excellent service and adhere to the most stringent automotive industry standards. Learn more at www.cypress.com/automotive. 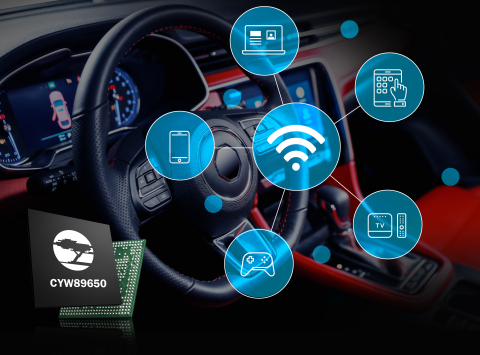 Cypress Semiconductor announced a new Wi-Fi 6 and Bluetooth combo solution for automotive infotainment systems that enables a premium user experience.